Where did all the horses come from? Aren’t they part of the past, shunted aside by the internal combustion engine? On the contrary, horses seem to be increasing everywhere, some of them owned by the most unlikely people. Some of these equestrians, having quietly owned horses for years, have decided the time is right for them to confess their addiction. “Society is more tolerant now”, they reason, like a gruff, solemn community elder admitting that, for years, he’s kept a paramour on Galiano Island. “There won’t be so much scorn and derision when I tell people I have a horse.” Others are enthusiastic newby horse fanciers, often people who could buy whatever they wanted and opted for equines. They’re all ages, four to seventy-four, and all professions. Lawyers, land agents, accountants, truckers, druggists, sales people, secretaries, hockey players, hairdressers, office staff, mechanics, professors, loggers, doctors, all own horses. Most of these horse owners don’t own much land. Horses need places. 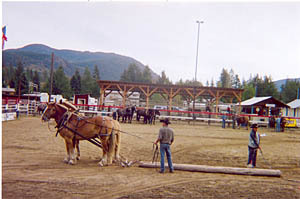 Boarding horses is a rapidly growing business. On the surface it’s hard to explain the horse’s surge in popularity. A relative of mine whose previous companion animals were a rebel cat which ate woolen socks and a dog small enough to fit in a sports bag, now has a herd of six horses and discourses vehemently on the merits of various horse blankets and the availability of hay. Now, the cat and dog, while they had their idiosyncrasies, shared one advantage; they were easily portable. A horse is not. Why are animals which require time, space and copious amounts of money in such demand? Maybe it’s a subliminal social acknowledgement that the gasoline engine is on its way out, that its life span is limited. In recent decades horses and those who rode them were odd anachronisms, to be pitied if not actually laughed at. They’re not laughing in France, though. There, in more than seventy towns, horses are already replacing motorized service vehicles. For work requiring frequent stops along short distances horses have worked better than trucks and cars. They are used to collect recyclables and for street sweeping. Some municipalities are thinking of using them to carry children to school. The carbon footprint of a horse drawn carriage rather than a school bus is still being studied, but, as fuel prices and pollution increase, using horses to provide some city services is gaining favour in France. Of course there are skeptics. “They eat horses, don’t they?” muttered one when I extolled France’s horse-friendly transport policies. Here, in B.C., after the recent budget increasing taxes on fossil fuels, with more and worse to come, a horse is beginning to look like a reasonable, viable alternative, not an expensive, frivolous antique. Certainly a horse-powered world would be a slower one, but, is that so bad? The horse has other advantages in our cold Canadian winter. Horses will usually start at forty below. Olivier Linot who heads a horse promotion commission in northern France says horses can reduce job stress, that civil servants would be happier if they were working with horses. In every movement there’s a tipping point, beyond which the momentum can’t be stopped or turned back. For me the tipping point was a Christmas card sent by my in- laws. Central to the sparkling winter scene are two horses, a bay and an appaloosa. These relatives have never been horse people. I’d have bet horses never entered their minds. I was wrong. Horses, there’s no stopping them now.